With the help of Polar App you can display graphs that are defined by polar representation. In the symbol -view the term for the radius as a function of the angle is defined and you can set the color for the graph. The test function is activated by selecting the hook. 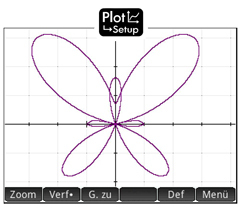 In the Plot-view its graph is displayed. By touching the multi-touch display the graph can be adjusted as desired. A zoom function is available via the + and - buttons. 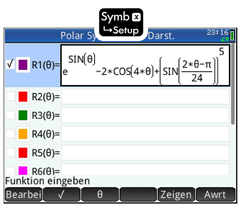 In the Num -view, the polar coordinates are displayed. With a flick of the finger on the multi-touch display you can comfortably scroll through the table of values. 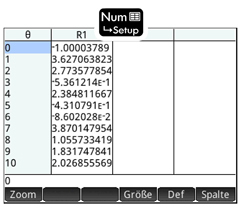 Using the "Zoom" function, the value table are "refined" arbitrary. Download your latest version of the firmware, now with 3D Graphing on Prime!